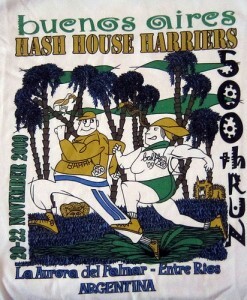 The Hash House Harriers in Buenos Aires, and around the globe, are a perfect combination of jog and jocular. Often and proudly self described as ‘a drinking club with a running problem’ the group has a distinguished history with exotic routes as far back as (now) Malaysia in 1938. While the group continues on the “down, down, down…” all the drinkers are to down their beer as fast as they can, only showing they’ve completed the task by upturning the cup over their heads. If you’re a bit too slow, the chorus of “down, down, down” turns to “whyyy are we waiting, whyyy are we waiting…” but do not let this unsettle you. The group is friendly and you can take your time. Or, dump the foam behind your back. One can notice that more tame or experienced hashers sit safely in the background while those more fervent, or new, are at the fore. The best part of the Hash House Harrier experience is the hashers themselves. There is always a combination of friendly expats and locals alike, one may find themselves talking about futbol, politics, business (with a beer penalty of course), or the happenings about town. You’ll leave with a warm feeling, either from the beer, the new found friends, or both. Totally agree – Great article, and all are welcome to the Hash. This page rendered in 0.413 seconds.